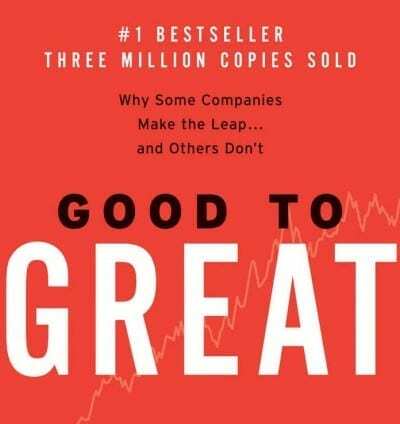 Good to Great has dominated the business bestsellers list for years. It asks the question; what does it take for a company to change from a good one to a great one? Jim Collins started his research for the book with the entire Fortune 500. He then identifies eleven companies that made the transition from good to great. To make the list a company had to first have ten years of average to below average stock market returns. They then had to have fifteen years of returns that were at least three times better than the market. And they had to do this without just riding an industry-wide wave. To identify what is unique about the Good to Great companies, Collins uses comparison companies. The comparison companies are in the same industry, and of about the same age and size. They have similar or even better financial results in the initial period. But they do not produce the superior results required in the second period. In other words, they have the same opportunities and challenges but they don’t deliver the results. Jim Collins the author of the book warns that companies can’t just go off-site for two days and come up with a transition strategy. Of course, he is absolutely right. However, an executive team should make tremendous progress at a well designed off-site. Over the years we have facilitated dozens of Good to Great sessions. Our clients go all the way from the Washington State Republican caucus to Morgan Stanley Ultra-high net worth. What follows is a description of our approach to “getting the right people on the bus”. Do you take their performance problems home with you to your family? Would you be secretly relieved if this person told you they were leaving the company? Have you had to give them multiple chances to get simply acceptable performance? Have you had to build compensating controls to get simply acceptable performance? Do their colleagues feel they are not pulling their weight? Each executive answers the five questions with a yes or a no for all of their direct reports. They also answer the questions for the next level down. Other executives are allowed to comment as long as they can give concrete examples. Multiple “yes” answers trigger the need for an action plan. The action plan has to fix the situation within six months. Every time we have done this activity it was clear to everyone present just where the problem performers were and what had to be done about them. Another thing we do is hold a “team draft”. We use a sports analogy to help make it clear what we want to do. In this analogy, the coaches take a look at their entire roster of players at the end of the season. It may be fifty players in total. In the coming season, they want to have a winning team. They cannot afford fifty superstars so they have to pick very carefully where they need their top performers, and who they will be. They also need to build the team as a team, and not as a collection of individuals. The other positions around the top performers will then be filled with the best available people. Some of the superstar positions will be filled from within the team, others will require that the team goes outside to the market. With these instructions, the executives all do their first round draft. In the first round, each executive drafts 20% of their total team. The ensuing discussions make it very clear who the top people in the company are. The results tend to be surprising to some, and worrying to others. Too often we find that the company needs to go outside for several key spots. Worse still we often find non-performers in slots that need superstars! The final activity helps make sure that your best people are on your biggest opportunities. Our approach here is straightforward. First, we brainstorm lists of your biggest opportunities and of the biggest problems. (Usually, we have already done considerable work on this as part of defining your hedgehog.) Next, we conduct a multivote whereby everybody votes for the top three of each. We use the results of the multivote to priority rank the lists. We then ask for the name of the person who should be responsible for seizing each opportunity. Then we gather the names of who should be responsible for addressing each problem. With this done we can now discuss the alignment (or lack of alignment) between your best people and your biggest opportunities. This discussion leads to more action items. After these discussions, clients tell us that they feel they now have a winning team that is focused on their biggest opportunities. For more information on Jim Collins and his writings go to www.jimcollins.com Please note that we are not associated with Jim Collins in any way.